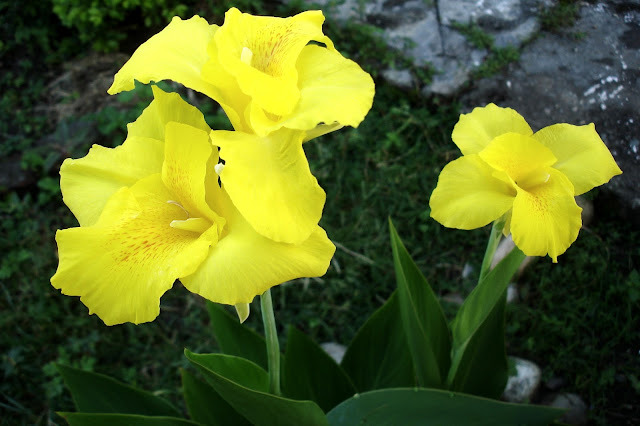 Canna or Canna lily, although it's not a true lily, comes in varied colors may it be red, peach, yellow, pink or a combination of two or more colors. They are perfect for your alley, along your fences, the edges of your ponds or corners of your garden or just right at your gate. This is my first bloom a few weeks before winter last year. I uprooted them from ITBP hospital garden. Wondering what's the color gonna be, since nobody seems to notice their flowers, I planted them in five places around the free space we have here, which I already converted to flower garden -well, portion of it because some areas are very rocky and a little difficult to dig the soil. Although not everyone gave blooms this one yield pretty much. Another one more gave quite a number of blooms near our compound wall but monkeys just couldn't get their eyes off them so they didn't last long. This year I'm hoping to see some more flowers. I have uprooted and replanted some Cannas to different places to avoid overcrowding. The name Canna originated from a Celtic word for crane or reed. For the best foliage color and greatest number of blooms your Canna should be planted in areas where they receive full sun. The rhizome of Cannas is rich in starch. So if you decide to include this beautiful bloom in your garden, here's a quick link for you to guide you more about Cannas. Good luck!